For centuries, the main activity on the island was the extraction of iron, which Elba has always lavished upon those who extracted it and made its overlords rich and powerful. The extraction of iron has continued until recent times, and the mines were only closed in 1983. Although iron characterised the economic and social life of the eastern part of the island, in the western part, the inhabitants have been involved in the extraction and processing of granite since ancient times (the columns of the Pantheon in Rome are made of granite from Elba), and the sound of working with scalpels to extract forms from large boulders of this very hard rock has not yet ceased altogether. The richness of the subsoil, which contains more than 150 types of minerals (quartz, hematite, tourmaline, pyrite, azurite, malachite, chrysocolla, orthoclase, beryllium, etc. ), has produced some mush admired handicraft by the local craftsmen, transforming the precious stone into jewels and items of furniture. Because of its richness, the island of Elba and the islands in the Tuscan Archipelago are on the UNESCO map of scientific locations of greatest interest on the planet, an open air treasure that can be seen and appreciated in the Rio Marina Mineral Park and the Alfeo Ricci museum of Elba minerals in Capoliveri. Elba is renowned in Italy and worldwide for its production of wine, which has a longstanding tradition. The wines of Elba, famous since Roman times (Pliny the Elder describes them as “Insula vini ferax”), was drunk by the Popes in Medieval times, and sailors in the eighteenth century transported it to the major trade ports. 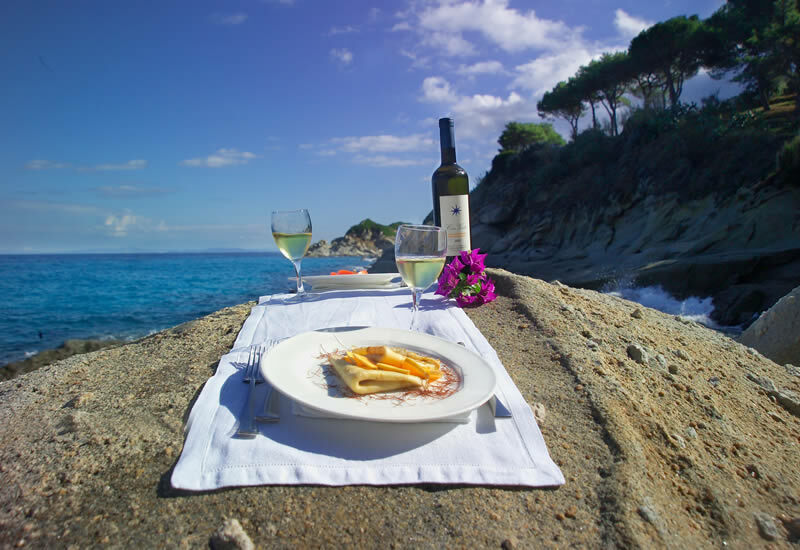 The island now has several renowned DOC wines: “Elba rosé”, “Elba white”, “Elba red”, the “Ansonica” reserve red, sparkling Elba white and some renowned dessert wines, such as “Aleatico” and “Ansonica passito”. These are all the perfect accompaniment to the typical dishes of local cuisine, which still provides some ancient and well liked recipes originating from the cuisine of the miners and mineral workers as poor dishes, and the homemade desserts baked in wood-burning ovens. Solid and impressive chestnut trees grow on the mountain slopes, the cultivation of which dates back to the 14th century, the fresh, dried or ground fruit of which was the basic element of the mountain people until half a century ago. During the autumn, the forests of oak trees provide over 200 species of mushroom, the cep and ovule being the most sought after and appreciated. Honey, in its wide variety of flavours and types, is a very particular product: millefiori, chestnut, berry, heather, eucalyptus, rosemary and chestnut husk honey each symbolise the perfumes of the island and the flowers of Mediterranean forests. In recent times, the local handicraft industry has began to incorporate the essence of these aromas into its products. Olive trees are cultivated nest to the vines, producing olive oil of excellent quality, according to the best Tuscan traditions. Characteristic of the variety and simplicity of these basic ingredients (honey, dried fruit, spices), the breads and sweets of Elba should also be savoured with a glass of the island’s wine: schiaccia briaca, corolli, sailor’s sweet bread, almond cantuccini, aniseed cantuccini, schiacciunta, pane ferettato and frangette. The sportella is not to be missed; this is a bread which is traditionally exchanged by lovers during the Easter period as a gesture of happiness.